When Patrick is murdered, Katelina is left with questions. Jorick, one of his so-called friends, has answers of the darkest kind: Patrick was involved with – and betrayed – a coven of vampires; vampires that may now be after Katelina. 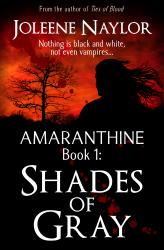 The disturbing opener to the Amaranthine series pulls Katelina into darkness that tastes like fear and smells like blood, a world where night is eternal and vampires don’t sparkle.